Chris from the US started visiting us last springtime, his teeth were in a very bad condition. His treatment has started with a first consultation as soon as he landed in Budapest. During his five-days stay, our dentists extracted some teeth that couldn’t be saved. Four months later he got back on the plane to get his dental implants. This procedure took only 3 days and we had to wait 4 months again before continuing the work. It was fascinating to see the hope on his face at the beginning of each treatment and the satisfaction in his eyes when he left. 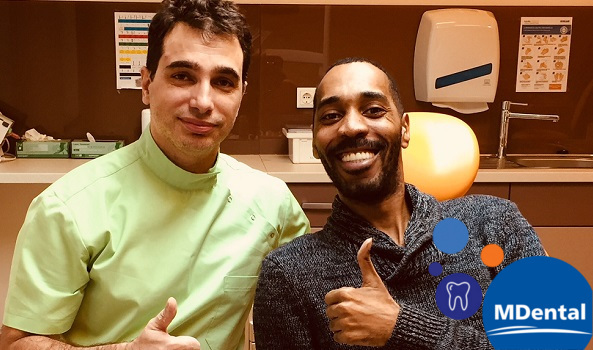 Our new oral surgeon, Dr. Kemecsei was just as excited as Chris when he finished to put shiny porcelain crowns on his dental implants at the end of the treatment. Thank you Chris for choosing us and see you again for your first annual check-up.